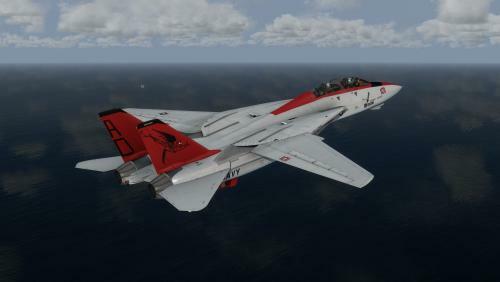 This is a repaint of the VF-31 Tomcatters F-14A BuNo 161850 from the 1989 era. The aircraft was painted overall Gull Grey with full color markings and insignia. Its mine, thanks. I haven't had a chance to put it up yet...took those shots while testing - still need to fix a few things. This is a repaint of the VF-103 Sluggers F-14B BuNo 163227 as I saw it parked on the ramp at NAS Oceana back in April 1994. The aircraft was painted overall FS36320 Dark Ghost Gray with markings and insignia in Engine Gray FS36076. It was relatively clean having been recently repainted and shore-based for work-ups. I tried to keep the paint as close to what my photos showed. 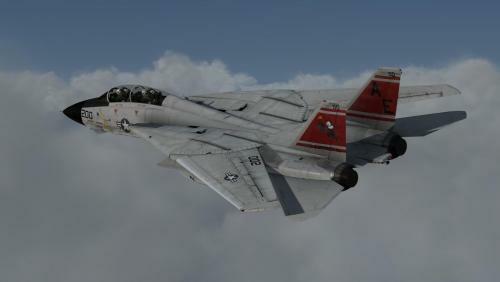 If you notice anything that needs fixing, contact me through the Aerosoft forum > dsem66 Thanks, Dave PS: I just noticed another Sluggers repaint posted by Groom Lake! Sorry guys, this is a total coincidence - I have been working on my repaint for weeks prior. Well, if anybody wants an additional F-14B you got it. Just finished this repaint...Let me know if anybody wants it for download. 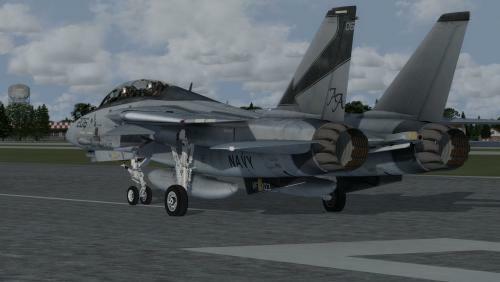 Hey man, thanks for the repaints for the F-14, great stuff! I wanted to ask if you don't mind, what software do you use for repainting? I have photoshop but I cant figure out if I should get that dxtbmp or use the Nvidia plugin for photoshop (or both). Thanks dfw, appreciate the work!